Chick-fil-A is offering Science Kids books as part of the Kid's Meal Program. My daughter got the book - Science Kids: Birds by Nicola Davies. This Book gives an insight of birds - Body parts(Beaks, Feathers, Feet...), different ways of flying, Migration and lot more. The book full of spectacular photographs of birds, provides a wonderful real time exploring experience. 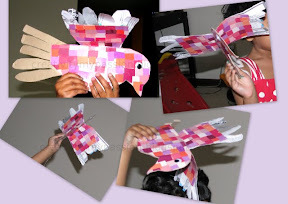 It also includes a hands-on project to create a bird book. I had pulled open the sides of the tissue paper box so that it can flattened and stored easily in the recycle bin. The Pulled out sides looked like wings and triggered CJ to make a bird. Pull open the sides of the Tissue paper box. Cut along one edge of the box. Take the rectangle piece with the rectangular opening. Fold it into half to get wings shape. Cut along the outline to get the bird. For the eyes of the bird, glue Googly eyes. For the feathers,Cut some paper feathers and glue them to the wings. Your bird is ready to fly!!! CJ just loved the way it turned out. Happy creator of the bird! She zoomed all round the house with her birdie. ZOOM!!!! She was so impressed with her birdie that it became her bedtime cuddle up toy! CJ's most FAQ about birds is "Why do they have beak?" The Bird book by Nicola Davies says "Birds do not have teeth, Instead they have beak to grab whole food or to peck it to pieces" so I repeat the lines from the book. CJ goes peck, peck with her bird beak. She also had fun pretend feeding grains to her bird. Oh my oh my oh my I LOVE your bird! It is beautiful! What an excellent way to reuse that tissue paper box. WOW!! Well done you! Love how beautiful and colorful ur bird is...Woww! Thanks Maggy and Putti amma! All the credit goes to CJ! We love crafts that can be toys - and this one is terrific! This is awesome, so creative and great recycling project. Great way to recycle that fancy box. It made a very colorful bird. It turned out great! My little ones love creating from recycled objects. I featured this today on Fun For Kids Finds! Esther, I'm really awed by CJ's creativity! 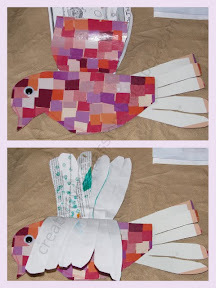 Such a wonderful recycling craft! It's always such a pleasure to have you link up at Rook No. 17! How creative and clever! The bird is lovely - and it's lovely to see you at the Play Academy again. You so need to link this activity to the Tissue Box Challenge I am hosting. The link will go up on the 17th. What a cute bird :) I love it! Thanks for linking up to the Tissue Box Challenge. Thank you for linking this great idea up! I would have never thought of this! You have won second prize in the Tissue Box Challenge! Please contact me at jdaniel4smom@aol.com with your address and I will send you your prize. What a wonderful idea! I would love if you would like this up to Made by Little Hands Mondays! What a pretty bird!! I love that you picked this to link up to the blog party! Happy New Year, Esther! Love this beautiful bird - looks like so much fun! Thanks for sharing. I hope you can visit my blog. I remember the first time I saw this. What a great activity! Stopping from the Kid Bloggers Hop! Such a beautiful bird! I missed seeing this project the first time around since I started my blog in May. I am so excited to give it a try this year.